I’m back! This was a fun page to work on after the overload of the city on page 6. Actually, while drawing this page, I realized that the problem with page 6 — and to a lesser extent, this page — is that it’s actually too detailed beyond the point of visibility. I have the urge to show so much stuff happening, to pan the camera out so far, that it risks turning the page into “an inky black hole”, to quote Berke Breathed. I vow to learn a lesson from this going forward. This page, like the previous one, actually needs a bit of work and toning… but I’m pretty happy with it. 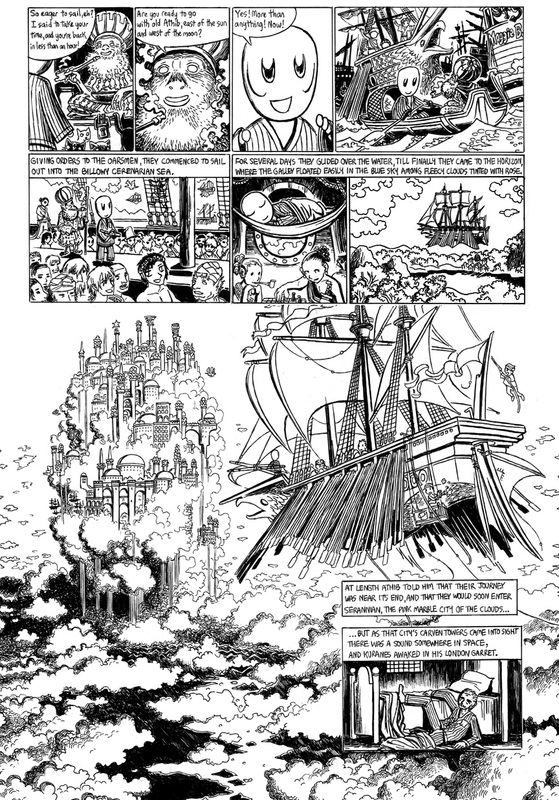 The ship was originally based partially on a Venetian galley, but it quickly turned into a purely fantastical ship, partially because I couldn’t imagine drawing this scene without drawing billowing sails, and galleys are the least sail-equipped ships there are. Why galleys, Lovecraft? Why not galleons? I know you loved the Roman period, but come on! So I ended up drawing a sort of bizarre galeass or galliot, flying towards Serannian perched on its cumulonimbus. UPDATE 8/17: I’m working now on the new page (pages 8-9), but I won’t be able to upload it until Thursday. Sorry everyone! On the other hand, it’s turned into a double page, so that’s why it’s taking so long! Please check back late Thursday night or Friday morning! Classic “Little Nemo” pose ? At least Kuranes isn’t exclaiming, “Oh–oh! Mother!” as he awakens upon hitting the floor! I’d love to see a colored version of Serannian, the city in the clouds…again, this image would make a wonderful poster, or even a page in a “Dreamlands” coloring book. Yes, it’s totally supposed to be a Little Nemo reference. I love that comic! It’s a shame that it’s so hard to depict in visuals the ship simply meeting the horizon and continuing on into the sky, the way Lovecraft describes it. I remember that some artist did a very nice flowery illustration of Serannian in the “H.P. Lovecraft’s Dreamlands” supplement for the Call of Cthulhu roleplaying game. The “Field Guide to Creatures of the Dreamlands” with illustrations by Mark Ferrari is definitely worth picking up; his colored pencils are incredible. I really like the way that black transitions to white in the clouds. I really need to read the “Little Nemo” comics someday. My library does have a copy, but they can’t be signed out. Don’t worry Jason – Historically, vessels called galleys have had either/both sails and oars. The exact origin of the word is unclear, but there are several hypothesis – widely favored is one that it derives from the Byzantine Greek ‘galaia’, a variant of Greek ‘galeos’ = “dogfish or swordfish” (the dogfish is a shark with weasel-like markings). The Byzantine term originally denoted a small, light fast warship – a dromon – on which sails were used as well as oars. Dromons relied on oars for their tactical manoeuvring and sails for cruising when the direction of the wind was suitable. I’d like to thank Jeff for his capsule discourse on the subject of galleys. Ted Sturgeon had a vision of humanity’s future, where telepathy enabled the free and fast exchange of any type of knowledge from one mind directly to another. The Internet is far from perfect, but sometimes it comes strikingly close to Ted’s dream, albeit in a slower fashion. Just think what Lovecraft could have done with no postal lag in his correspondence! No problem. If you’d made this panel a year ago, I would have been mostly clueless – but I’m in the middle of designing a naval tactics game, so I got to crib from my own notes! @Jeff – Thanks for clearing that up! I’m happy my drawing sort of falls under the scope of what Lovecraft might have been thinking about. @Esn – Little Nemo is great! I think the first year or so is best, then he starts to repeat himself a bit, but at its best the art is simply stunning. Makes me so happy to see this. This wasn’t in the White Ship book that you printed was it? Is this in print? Hi Rob! No, Celephais and Strange High House have never been printed… yet. I’m working on the next Celephais page right now! Jason: Yes, I remember reading that comment of King’s in his memoir/how-to book “On Writing” and I’m not sure if I quite agree with it. Certainly there are parallels between the amateur journalism of HPL’s day and the internet culture of our own, but Lovecraft always seems to me to be more exclusive in his circle of contacts. It may be just a matter of degree…he would probably have loved being able to instantly disseminate multiple copies of his manuscripts to his writing circle (that is, if he could adapt to composing without using his beloved Waterman fountain pen). I can’t remember where I read it, but someone once compared SF fandom back in the 1930’s to medieval monks trading illuminated manuscripts back and forth during the dark ages; it seemed like the last remnants of classical knowledge were surrounded by an ocean of barbarism. Asimov’s “Foundation Trilogy” makes a lot of sense viewed in this light. Communication is much faster and easier nowadays–maybe a bit too easy? If anyone can do it, sooner or later they will–even if they don’t have anything much to say. On the other hand, I shouldn’t romanticize Lovecraft’s day too much–after all, he would have instantly recognized the concept of the “flame war”. It’s finally doooonnnnne! Two days late!